Full Name: Dr. John P. Girard. Full Title: Peyton Anderson Endowed Chair and Professor of Information Technology. Degrees: Doctor of Philosophy (Business Administration) and Master of Business Administration (Information Technology Management) from Touro University International, a branch campus of Touro College. Bachelor of Science (Computer Science) from the University of Manitoba. Attended the Canadian Forces College in Toronto and Royal Military College of Science in the UK during a 24-year career in the Canadian Army. "The 24/7 always-connected, competitive environment in which our students will live and work is very different from the workplace I first entered. To be successful in the future, I am absolutely convinced that our graduates must be conscious of global challenges and opportunities. Gone are the days when students can just consider local, state, or even national issues. To help them succeed in this new world order, I wish every undergraduate student could participate in a global experience. To that end, much of my energy has been focused on finding ways to expand the international opportunities available to our students. A good example is Knights Impact, a recent international service-learning adventure coordinated by the Office of Experiential Learning and the Office of International Programs. I am very proud to have played a small part in helping more than two dozen MGA students travel to the Dominican Republic where they participated in a variety of volunteer activities including reforestation, manufacturing water filters, teaching English to students, building concrete floors and so much more. Watching our students work with the Dominicans proved to me, once again, just how important it is for us to offer such opportunities. I believe Knights Impact is proof positive that we must design affordable, high-impact activities to ensure as many students as possible have access to these potentially life-changing global experiences. "Last year I was very fortunate to participate in the Fulbright Program and spent six weeks at Al Ain University of Science and Technology in the United Arab Emirates. Despite being 7500 miles apart, our two universities have an awful lot in common. I was surprised to learn just how alike Al Ain University students are when compared to our students. In both cases, I see a genuine thirst for knowledge and desire to succeed, but I also see students who struggle to balance the real-world needs of working and family commitments with studying. Equally, I saw many similarities with faculty at both universities. I hope my time at Al Ain University will lead to a formal agreement between the two universities that would enable short-term study trips, faculty exchanges, or joint research projects. I would love to see a day when there is frequent collaboration between the two great institutions." "Simple answer, the academic programs. When I interviewed three years ago, I was particularly impressed with the School of Information Technology’s programs. There has been a huge change in IT programs in the past decade and many schools across the country have simply not been able to innovate to meet the current needs of students. The School of IT faculty have been very forward thinking in designing engaging programs that balance academic theory and the applied nature of technology. A great example is the early adoption of undergraduate majors in digital forensics and cyber security or more recently the graduate programs. Each of these engaging programs are very popular with our students and appreciated by regional employers. I commend our faculty for continuing to look to the future and adjusting our programs accordingly. Change is never easy, but in the IT field we must always be scanning the horizon to see what is the next big thing." "Working with students. Almost without exception I have been very impressed with MGA students. Our recent trip to the Dominican Republic reinforced my belief that our students have strong character and want to do good. When you are surrounded by great students being a professor is the best job on the planet!" "In the IT field, it is vital that students remember that our undergraduate degree forms the foundation for life-long learning. It is imperative that our graduates continue to learn about technology through professional development or graduate school." "I am never quite sure what will surprise our students! Maybe that I have traveled to 116 countries or perhaps that I was presented to Queen Elizabeth II at Buckingham Palace." 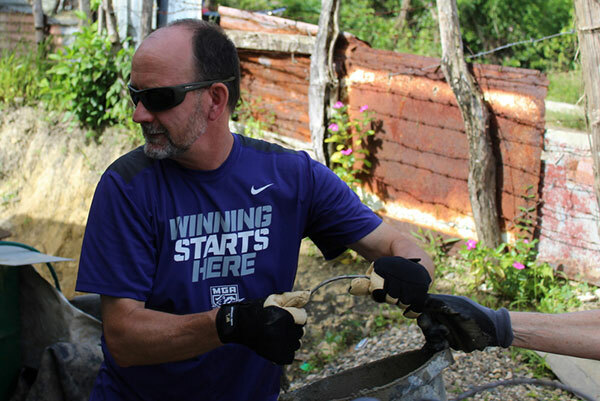 Photo: Dr. John P. Girard joined students at their service-learning activities in the Dominican Republic. Here he is helping replace a dirt floor with a concrete floor in a private home.